Yup! Luv My Mod Podge! Hello to all! I feel like time has gotten away with me this week. I haven’t even visited many of your blogs and linky party’s that I love. So sorry, I’ll do better. Summer has been busy with having all four of my grands home at once, but it has been really fun and we have done a lot of creative projects together. I have also been able to sneak in a few of my own and I’m excited to share them with you. I used the same process that I did on my other mod podge projects. If your interested just click here. 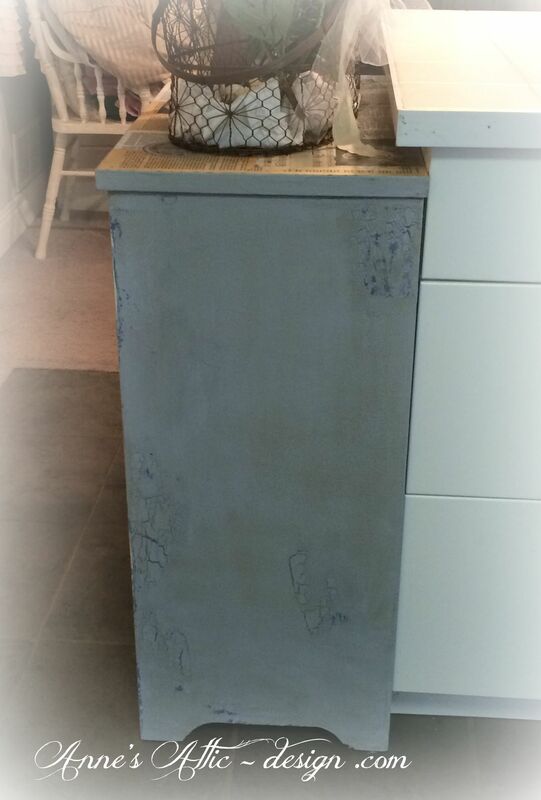 Before I did the mod podge, I painted the shell of the dresser with a light gray chalk paint. I also used my favorite crackle (click here for the crackle process) to give it that wonderful patina that I love. 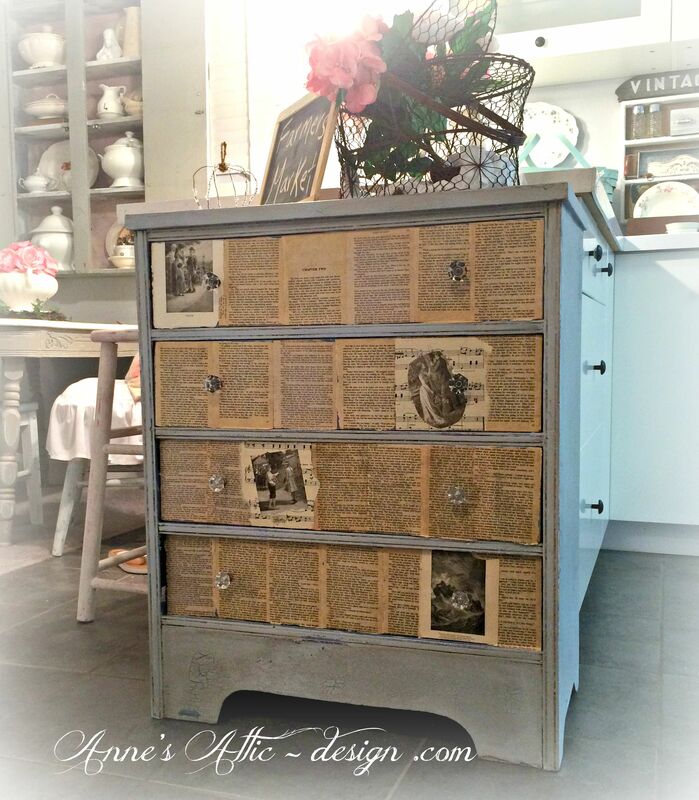 The dresser was painted in a flat french blue, I wanted that to show through the gray. I used some vintage books for the top and the drawers. They have that nice worn out look! 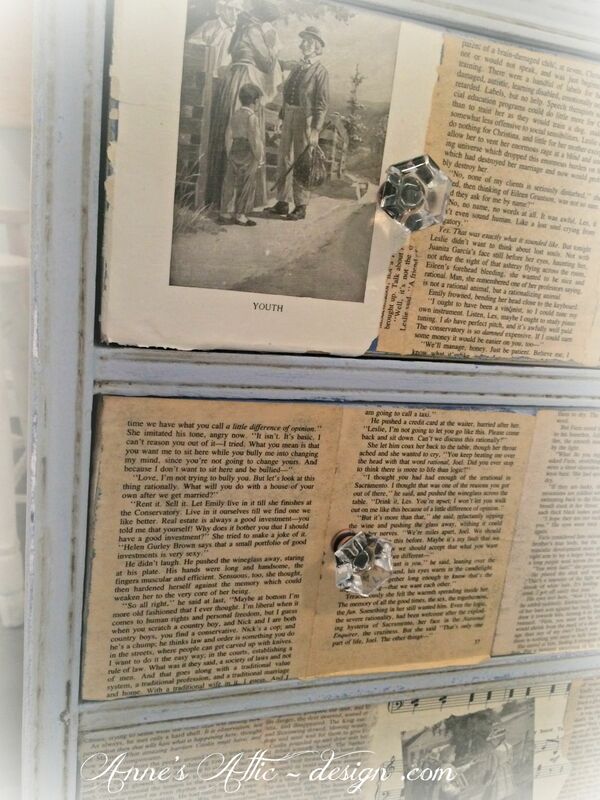 I even used some old sheet music and added vintage photos from books on it. So sorry I didn’t notice the little finger prints on the chalk board. Oh well. One thing about mod podge is that it leaves a nice surface after it is dry and I can wipe messy’s right off, and at my house that is a must. I really like the way it turned out and it adds a lot of charm to my kitchen and added storage. 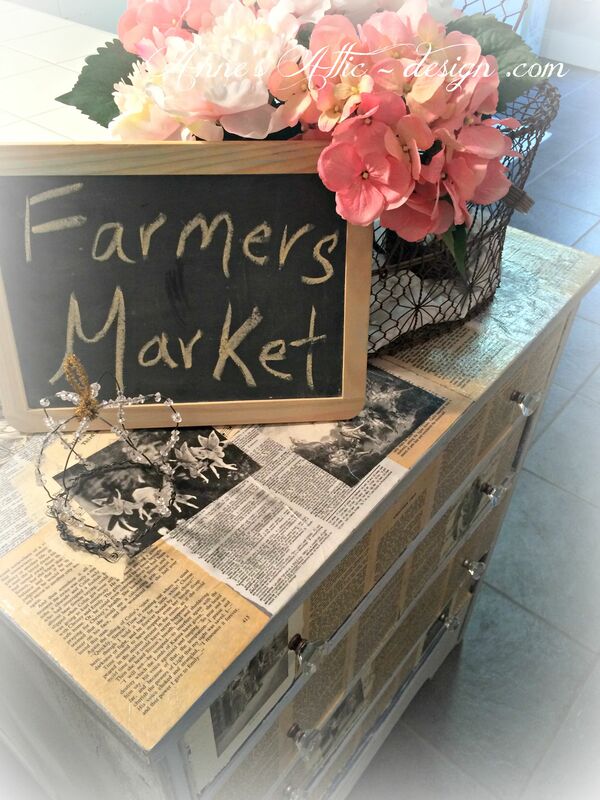 I would love to hear about any of your projects that you are doing or if you have a temped a mod podge project. Thank you for visiting my friends! Enjoy your day! This entry was posted in Anne's Attic - design, Crafting, DIY, French Nordic Country Design, Hodgepodge, Mod Podge, Old Books, Painting, Painting Furniture, Prairie Design, Vignettes and tagged Anne's Attic - Design .com, Antiques, French Nordic Design, Interior Design, Mod Podge, Painted Furniture, Painting, Prairie Design, Romantic Farmhouse, Shabby Chic, Using Books in Vignettes, Vintage Finds by Anne's Attic - design. Bookmark the permalink. Love that dresser, what a great job!! 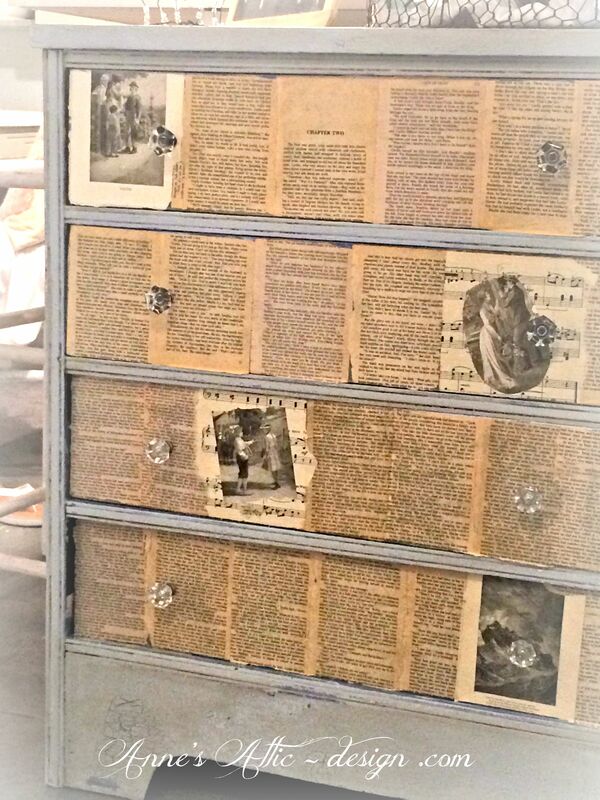 Love the use of the old photos and books, and, oh, how I love the look of crackle! Amazing how just how a little imagination can liven up an old piece of furniture! Great job and very clever. Happy Friday. Love,love,love. I’m almost brave enough to start my projects thanks to you! Have a great weekend! My old table that I use for cutting fabric (DH made risers for it so that it’s high enough for me) needs some tlc and this might be just the ticket! It’s old and battered and rather sad so would be much happier with a facelift. (btw – re the squeaky drawers – try rubbing a bar of soap onto the places where the drawers ‘rub’ – it works wonders, although it does have to be redone from time to time). I love the result and how the glass knobs make a nice contrast to the beautifully aged pages. Love it Jo! I love using Mod Podge as well. A couple years ago I painted an old armoire duck egg blue and I did the same thing with book pages on the shelf inside. Then I used it to apply cute floral scrapbook paper on the inside drawers. Fun surprise when you open it up. I love the images that you added! Thanks for sharing with SYC. That is awesome and what a wonderful addition to your kitchen! Perfect! Jo, you did a great job on your dresser. Glad you have been spending time with your family. I mod lodged some little wooden boxes the other day. You will have to go check them out! Have a great week. Great job and so clever! I’m all about making my furniture look older! Thanks for sharing at Vintage Inspiration Party. This is the BEST looking mod p project I have seen this month. I LOVE IT! Happy to hop over from the Thursday Fav things hop! Oh my that turned out so beautiful. What a unique piece. Love it! 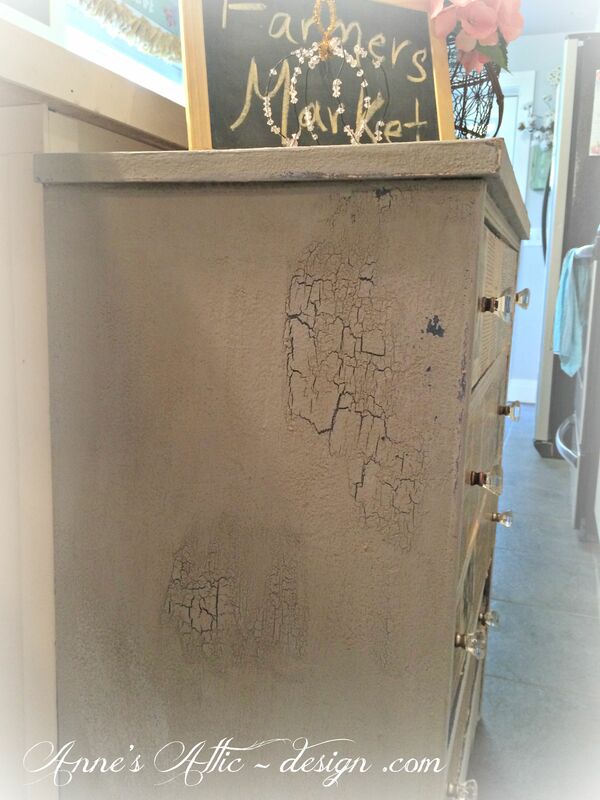 Wonderful design for the dresser, love the crackle parts too! Thanks for sharing with Roses of Inspiration, sweet friend. Hugs! I love the look! Thanks for sharing at Home Sweet Home! Your dresser looks fabulous! 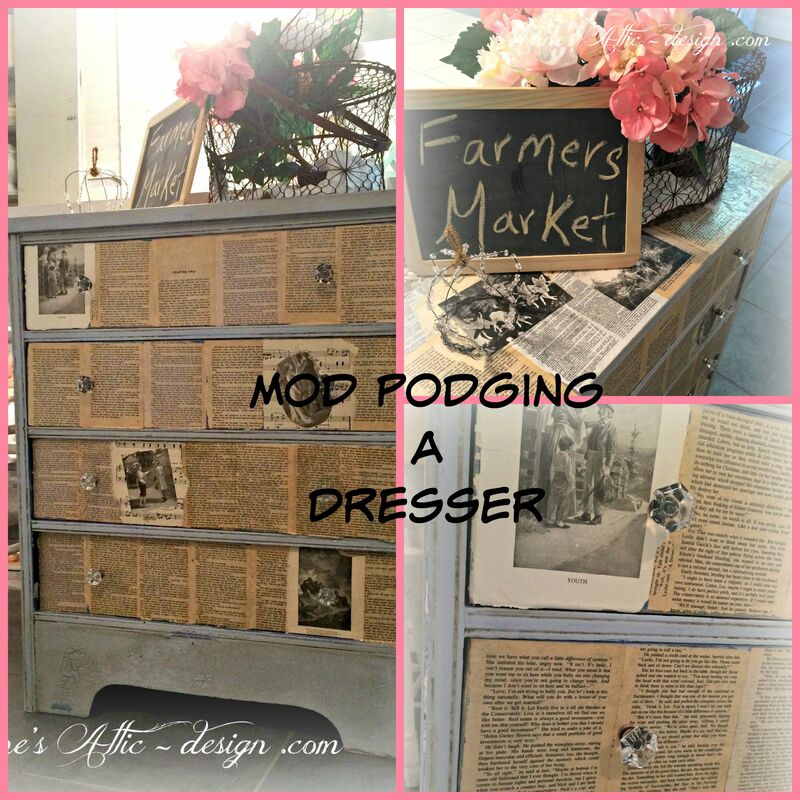 I love my Mod Podge too! I would love it if you linked it up to our new furniture fix link party so that others might be inspired by it!